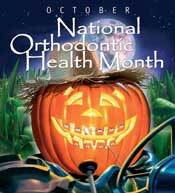 Dr. David Kristal and Dr. Robert Forche and our team at Kristal and Forche Orthodontics want to spread the word in the Columbus OH area that October is Orthodontic National Health Month. It is never to too soon or too late to undergo orthodontic treatment to achieve a beautiful healthy smile that lasts a lifetime. The purpose of Orthodontic National Health month isto draw attention to the fact that everyone needs to be evaluated for orthodontic treatment. You are never too young or too old if your bite or smile needs correction. American Association of Orthodontics recommends that parents start early and all kids be evaluated 7 – 8 years of age. During the growing years of 7 – 10, kids undergo a major growth spurt that goes hand in hand with the eruptive pattern of their teeth and development of jaws. An orthodontist specializes in the growth and development of teeth and jaws and can best determine if your child is a candidate for treatment and the optimum time to begin treatment if they can follow a child’s development from an early age. Intervening at the correct time, based on your child’s individual growth pattern, can prevent more long-term or difficult treatment later on if potential problems are addressed sooner. If your child exhibits any of these symptoms, scheduling a complimentary consultation to evaluate your child’s dental growth during crucial developmental years will enable you to determine if your child is a candidate for orthodontic care and when. We also recommend adolescents, teens, and adults exhibiting the same symptoms to schedule a complimentary exam. We specialize in the latest in orthodontic care for patients 7 – 70 and beyond! It is never too late to receive a beautiful healthy smile of a lifetime. “You don’t know… what you don’t know… till you know it!” Contact our office today for more information.